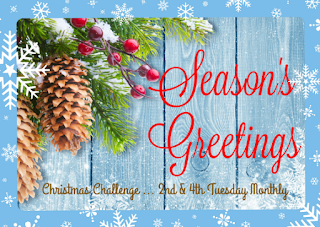 Playing along with Season's Greetings Challenge Blog (which is Christmas all year long) is a great way to get a head start on your Christmas cards, in a relaxed fashion and not in a rush! The theme for Challenge #3, is as always "Anything Goes" or you can use the optional twist "Wet & or Dry Embossing." After you check out how my card was made, be sure to go and see what the other talented Designers have for you today!! This month I picked to use "Anything Goes" to make my glittery my glittery card. 1. I diecut gold glitter paper with the Holly Die from Stampendous and glued it to a slightly larger white panel that had the center sponged with green ink. 2. I added red rhinestones for the holly berries and wrapped the bottom with red and white striped twine. This was then popped up on a red top folding card. 3. The sentiment was stamped with VersaFine Onyx Black Ink and embossed with clear embossing powder, on a white frame diecut using Fitted Frames B from Stampendous and layered onto a larger red frame. This was glued to the top of the card. Oh my...I just love your card Jamie. Wow...it's so lovely. Hello Jamie . 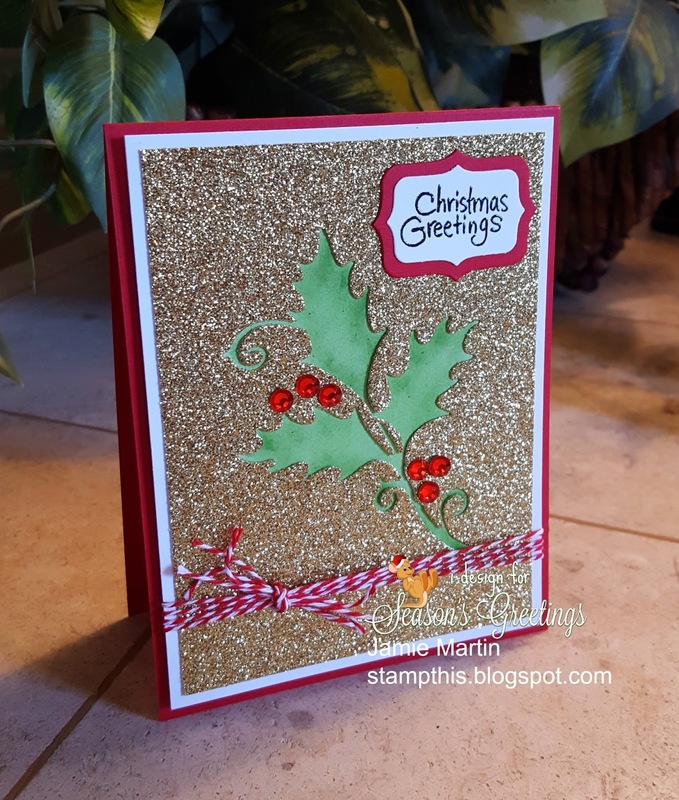 A delightful Christmas card .Love the gold and green with splash of red as berries . Love your style . Love that glitter! Fabulous card - so bold and bright.